Numark x2 Hybrid Turntable | OhGizmo! The debate over whether or not a digital turntable will ever be as good as the traditional vinyl-based models will no doubt continue for some time. However if you’re currently in the market for a new turntable but just can’t seem to make a decision then the x2 Hybrid model from Numark has got you covered on both the analog and digital sides. Besides its direct drive motor which is essential to vinyl-based scratching the x2 Hybrid also contains a CD drive that is fully MP3 capable. From what I can tell the x2 relies on a special piece of included vinyl for ‘scratching’ the digital audio files. 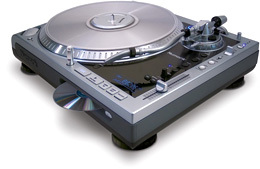 The turntable interprets the movements (or sounds) of the vinyl and in turn applies them to the buffered audio file. This is not unlike the special timecode-based vinyl used by the Final Scratch software system but the Numark x2 does all the processing internally and doesn’t require a seperate PC. The Numark x2 Hybrid is set to be released sometime in June with pricing information to be announced. I enjoyed the thoroughness of your info.